The first thing that comes to mind for most people when they hear “Dickens” is “boring.” Wrong. A Tale of Two Cities is anything but. Beginning with one of the most famous story openings of all time, Dickens takes us through a visually stunning web of historical stories taking place during the bloodiest part of the French Revolution. Themes, imagery, and motifs are so thickly distributed in the novel an entire book series could be dedicated to their analysis. But don’t just take my word for it – “Cities” is one of the bestselling novels of all time, and for good reason! An early war novel depicting life in the American Civil War by Stephen Crane. The Red Badge of Courage follows the emotional journey of a young man through realistic action, powerful themes and heavy symbolism in an eerie, surreal atmosphere. It’s a short book, so if you haven’t read it, maybe it’s time you did. Not only is it the definitive vampire novel that inspired big-time franchises such as Anne Rice’s The Vampire Chronicles (starting with Interview with the Vampire) and Twilight, it’s also a patient, haunting tale of evil reawakened. Read this and you’ll understand why Bram Stoker‘s Dracula stands the test of the time and remains one of the greatest horror novels ever written. While many consider the classic Jane Eyre to be an early piece of chick lit, it is anything but. Introspective, emotionally robust and progressively feminist, Bronte’s gothic tale is a coming-of-age story featuring a strong-willed woman who survives the brutality of the age to achieve her desires on her own terms. Themes of atonement, forgiveness, and success through independence and morality lend this classic some serious gravitas as a work of timeless art. A novella about two migrant workers who dream of greater things, only to be thwarted by their own flaws, social and economic status. Steinbeck‘s unflinching honesty about the unchangeable fate of those destined to fail because of their own disadvantages paints a harsh picture, but an emotional effective one concerning certain aspects of human nature. The ending is sure to make you wring your hands out of frustrated futility but Of Mice and Men is absolutely worth a read if you’re serious about literature. “1984” meticulously explores the future of communism, censorship, privacy, and thought control through the eyes of man who believes himself one step ahead of the government. More than anything, Orwell’s novel is a stunning thought experiment warning us about the fate of society without freedom of speech. If you love plots that feature plans within plans, intrigue, and thoughtful social commentary then pick up George’s book. Who knows? It might be your new favorite book. Brutality and humanity collide in this survival tale about a group of normal school boys stranded on an island. Together they build a new society which brings out dormant primitive instincts and ultimately plays out as an embodiment of Darwin’s Survival of the Fittest. Individuality and mob mentality clash in this provocative thought experiment in novel form. William Golding‘s Lord of the Flies will haunt you with it’s accurate depiction of unrestrained primal human instincts descending into violence and chaos. Everyone’s heard of them, but have you actually read the book? Unlike the realism or religious-themed works set in the same time period, Dumas’s novel is pure adventure, a story in which boys will be boys and have a hell of lot of fun doing it. The Three Musketeers is no stuffy piece of dense literature; it’s a fun romp from beginning to end. It only takes a few pages to understand why Dumas’s book inspired so much timeless acclaim. A classic which highlights culture and race in the American South, To Kill a Mockingbird stands up for human rights and equality at a time where doing so could get you killed. Capote’s book takes us through a more laid-back exploration of an even more rural, isolated area of the Gothic South. These books are paired together for a reason. Both Mockingbird and Other Voices, Other Rooms deal with children coming-of-age through the loss of innocence. Not only were they written by real-life best friends Harper Lee and Truman Capote, both are also featured as major supporting cast members in each other’s novels. Stopped writing? Need some help to jumpstart your creative juices again? Contact us and get professional feedback to get you on the road again. Rights to the book covers used in this article are not owned or licensed by Story Science. They are simply used as an expedient means for readers to acquire inexpensive copies of these books if so desired. This is not a sales pitch on behalf of anyone or any party. These books are truly amazing in their own right, regardless of version, publisher, or book cover. Gavin Hood’s Ender’s Game takes a science fiction classic and visualizes it with dazzling realism and originality. The opening is rough and plagued by hokey dialogue but as the story progresses it gradually comes into its own, culminating in arguably the most breathtaking climactic end battle in all of science fiction to date, although the penultimate battle scenes leading up the climax feel truncated, making the third act feel rushed. Asa Butterfield (the principal lead) delivers a performance that becomes increasingly impressive as the film progresses. As both writer and director, Hood impressively adapts difficult material to the silver screen, improving notable segments from the book such as the battle school sequence and simulated battles, and correlating Mazer Rackham’s final battle with Ender’s active progress during the course of the main plot. However, some adaptation decisions were more poorly chosen, such as the near total absence of Ender’s older brother, Peter, who features so prominently in terms of theme and character development (for Ender) but is almost completely absent from the film, despite his being referenced often. As written, the character of Peter should have been omitted altogether to prevent unnecessary dilution of the plot. Also the psychologist character whose presence remains strong throughout the story is so poorly written and spouts redundant dialogue and concepts that are not illustrated in the film, especially earlier in the portions. So much more could have been done with the character to both expand and draw out Ender’s character but very little is ever utilized. The character ends up as a bloated element of fat filled with hot air. Ender’s Game’s greatest weakness is its botched final reveal. By showing an additional point of view (an excellent adaptation choice) the filmmaker expands on the world of the story but presents the new information in a way that prematurely gives away the ending, thereby lessening the potential impact of one of the greatest reveals in science fiction history. Despite its shortcomings, Ender’s Game is an enjoyable cinematic journey through an original world tantalizing to viewers who are fans of science fiction. Ender’s Game was adapted from the widely known novel of the same name by Orson Scott Card. 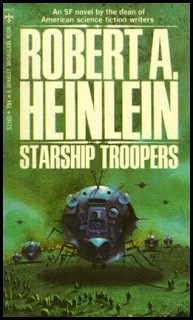 A nearly forgotten military sci-fi classic by author Robert A. Heinlein, Starship Troopers pushes science fiction beyond the commonplace genre novel toward the realm of literary fiction and its penchant for universal truth. By setting the story in a futuristic fictional setting, the author disassociates the book with any specific real-world war, allowing him to focus on a thorough examination of theme and moral philosophy. Part science fiction novel, part moral essay, Starship Troopers devotes considerable time to philosophizing about the role of the soldier, the military, and the obligations of individuals in a collective society, especially to their fellow man. Drawing from the author’s own experience in the Armed Forces, Heinlein uses his well thought-out universe to constructively criticize the faults of American society through the eyes of a militaristic fascist one. The novel’s thematic backbone creates a solid skeleton through which to elegantly explore the psychology of the soldier, specifically the infantryman, as he graduates through the various phases of his career from pre-enlisted civilian through mature officer. Heinlein also explores adjacent branches of this theme tree, including the developing relationship between master and student, commander and enlisted man, and father and son. With each new step toward maturity the protagonist sees the military machine with greater discernment and understanding (the military organization being a thematic substitute for ‘the world’ because in this case the military is the protagonist’s world). Despite being published in 1959, Starship Troopers provides the experience of reading a novel written 10 or 20 years later than its actual publication date. Unfortunately, the dated dialogue continually bursts this illusion, ever reminding us that the novel was written in the 1950s. An over-use of unnecessary dialogue hedges such as “Uh” and “Umm” at the beginning of character responses slows the pace of many scenes and takes the reader out of the world of the story. Readers expecting heart pumping action and thrilling space battles will be sorely disappointed in Starship Troopers. Heinlein deliberately steers clear of these tropes by means of the anti-“war genre” (e.g., anti-genre) to maintain focus on his themes and the insightful exposure of a combat soldier’s psychological journey. Despite the agedness of the book, many of his philosophical ideas remain universally valid to this day. Starship Troopers was adapted for the big screen in 1997 by writer Edward Neumeier and director Paul Verhoeven. 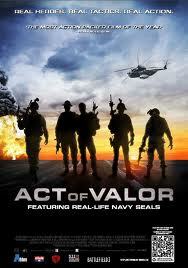 Act of Valor is a ballad of the unsung heroic deeds of Navy SEALs in clandestine operations. Although neatly structured the film feels less like a coherent story than a series of military reenactments with a few specks of story spliced in between action sequences. Valor is generously laden with fan service for military aficionados, but at times the ultra realistic use of military jargon crosses the line from necessity to extraneous masturbation. Action sequences deliver impressive intensity and speed while skillful POV camerawork immerses the audience inside each mission, lending a sort of video game feel to the advancement of the plot. The acting is as wooden as it gets and not just in terms of line delivery—no surprise, considering the principal characters are played by real Navy SEALs and not professional actors. Unfortunately this means that emotional tangibility with the main characters is difficult to establish, even with the repeated use of artificial filmic constructs employed to build personal empathy. Actor Jason Cottle’s uncanny intensity makes his performance stand out among the cast. If Act of Valor teaches us anything, it’s that “actual” does not equal “dramatic.” For a stellar example of how dramatizing reality improves its filmic qualities, see Seal Team Six: The Raid on Osama bin Laden. In spite of its painful dialogue and feeble plot, Act of Valor is a realistic, tense experience that military and action enthusiasts will love. Restrepo is the first documentary reviewed on this blog (and hopefully not the last) but is worth discussing due to its vigorous storytelling qualities. The film documents the most combat-intensive atmosphere known to US soldiers since Vietnam, wherein American soldiers find themselves engaged in 4-5 firefights a day for 15 unbroken months. Transcending the normal objectivity of the format, Restrepo thrusts the viewer into the startling subjective experiences of young soldiers right from the beginning. Illustrated by intense first-hand footage of combat, poignant interviews, and daily losses and gains, the film recreates the surreal daily life of these soldiers. Footage of “boys being boys” punctuated by ghostly silence and heart-stopping combat. What we see in the often unspoken psychological aftermath of war is devastating. The filmmakers quickly get a bead on what is human and interesting in the story. These men aren’t just soldiers in another American conflict, but youths who barely understand anything about their own world, let alone the incomprehensible foreignness of the world they have been dropped into. To these young men the war is not about ideology, the fight for freedom or any other such lofty goals. It is about surviving in an alien environment they will never understand. 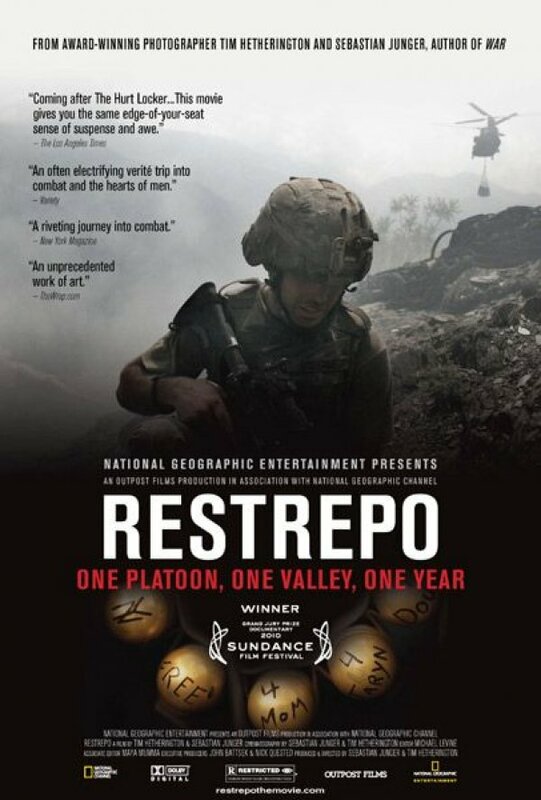 Restrepo is more emotionally intense than any synthetic war movie. At times it is beyond heart-wrenching. It is ultimately compelling. One of the best military documentaries of the decade.